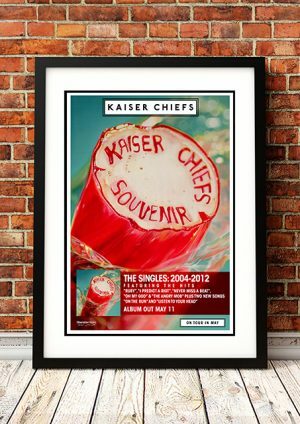 Classic Kaiser Chiefs Band Concert Posters and Memorabilia! Buy Online Now! Specializing in a melodic blend of classic Brit-pop, post-punk, and new wave, Kaiser Chiefs’ early blue-collar, pub-style take on indie rock managed to split the difference between timely and nostalgic. Comprising vocalist Ricky Wilson, guitarist Andrew White, bassist Simon Rix, keyboardist Nick Baines, and drummer Nick Hodgson, Kaiser Chiefs resurrected the mod spirit of the Jam in “I Predict a Riot,” a supercharged class-of-1977 power pop single that quickly electrified the British press when it was released in 2004. The song was inspired by Wilson’s days as a club DJ in Leeds, England, where the group was formed. The single and Kaiser Chiefs’ pogo-inducing, boot-stomping live performances had them pegged as rising stars in the neo-new wave revolution with Franz Ferdinand, Dogs Die in Hot Cars, and the Futureheads. When Kaiser Chiefs’ first 7″, “Oh My God,” reached number 66 on the U.K. charts — a startling achievement for an unsigned band — doors opened for the group to share the stage with larger acts, consequently grabbing the attention of A&R scouts who wanted to sign them. “I Predict a Riot,” on the other hand, reeled in U.S. modern rock radio programmers caught in a blooming new wave revival. Without an American label deal, Kaiser Chiefs (named after the South African football team) crash-landed on some of the biggest U.S. alternative stations with the “I Predict a Riot” import single in late 2004. That same year they recorded their debut album, Employment, for the U.K. label B-Unique. The album was released domestically in the U.S. in spring 2005. 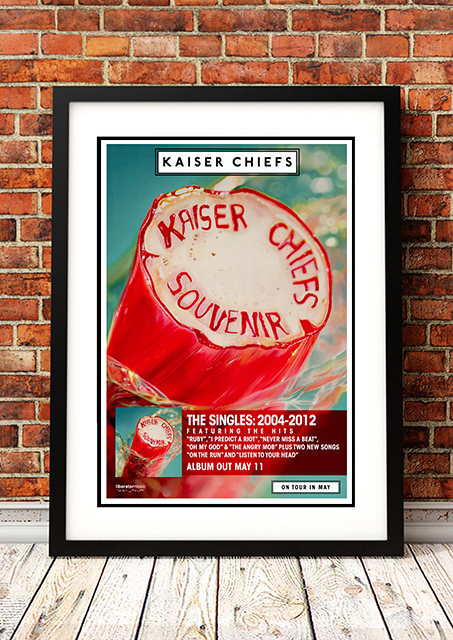 We stock some awesome Kaiser Chiefs Band Concert Posters.